Why these small-looking parts called garage door springs call for a whole page about them? – you might ask. These parts, almost invisible on your daily routine, do all the heavy lifting of the door. To put it simply – they are the muscle. Their coils store all the tension when the door is up, and this tension can be very dangerous when they break. So in a nutshell – you'll want to keep an eye on their condition, and stay out of their way when they look rusty or too worn. What should you do then? Well – that's where we come in! Why Can't I Just Replace the Spring Alone? Great question, and a pretty common one. You probably can try – but the question should be why you shouldn't. 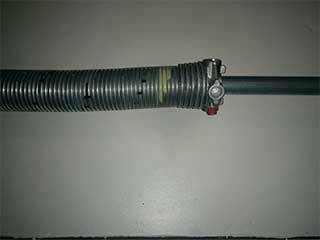 We mentioned the tension before – tension one that breaks loose when the spring snaps. The piece of metal might inflict direct injuries, sure. Let's say the spring already broken when no one was around, and the door is closed shut so it can't fall on anyone either. Do you know what type of spring your door needs? Did you change any panels lately or had windows installed? These might have changed the door's weight – so the type of spring you need might have changed as well. Getting the wrong type of spring is one common mistake – but even more common one is not replacing the other spring. See, the other spring may still be intact – but these moments when it supports the door on its own shorten its life pretty significantly. Avoid the Risk and Count On Us! There's no spring type on the market we aren't familiar with. We'll be there with every possible option so we can take care of the problem then and there, so no worries about having to wait for any parts to arrive. Another obvious yet often forgotten is you get full warranty for the service and parts. Can I Prevent the Spring From Breaking? Every spring is bound to break at some point, sadly ones that work that work forever were yet to be invented. However, you can avoid the unpleasant surprise of facing such an ordeal by having your garage door regularly maintained, once a year is enough. This way if there are any signs of wear, you will know and have the part replaced before it causes anymore trouble. Contact our experts today if you need any help with your springs or door! Our company guarantees your complete satisfaction when you choose our services. From repairs, maintenance, or installation of a new garage door, we are your number one team locally for the finest possible service. On this page you can read more about our company and our commitment to your complete satisfaction. Thank you for choosing Garage Door Repair Buffalo! One of our experts will be in touch soon. Feel free to browse our website for FAQ, tips and more useful information in the meantime!